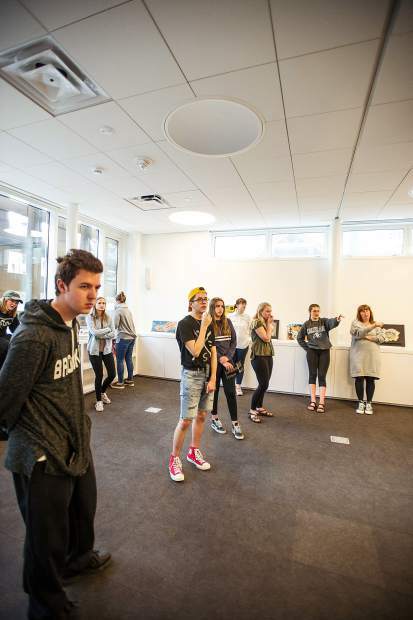 Young curators mull over artwork placement at the Aspen Art Museum on Tuesday. Rifle High School student Tania Avitia's "Blooming Dreams." 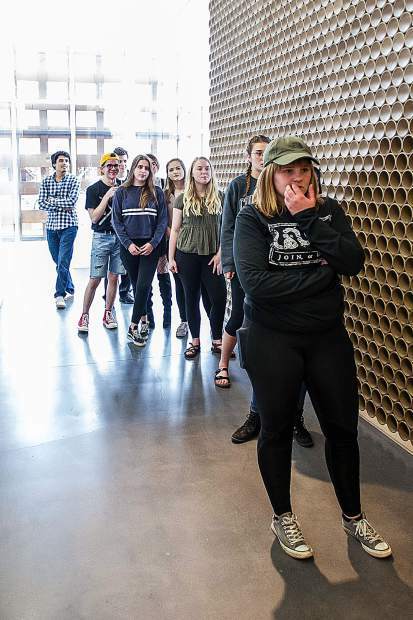 Aspen High School student Ava Lassalette's "Interference Stare." Rifle High School student Lauren Giard's "Times Up." 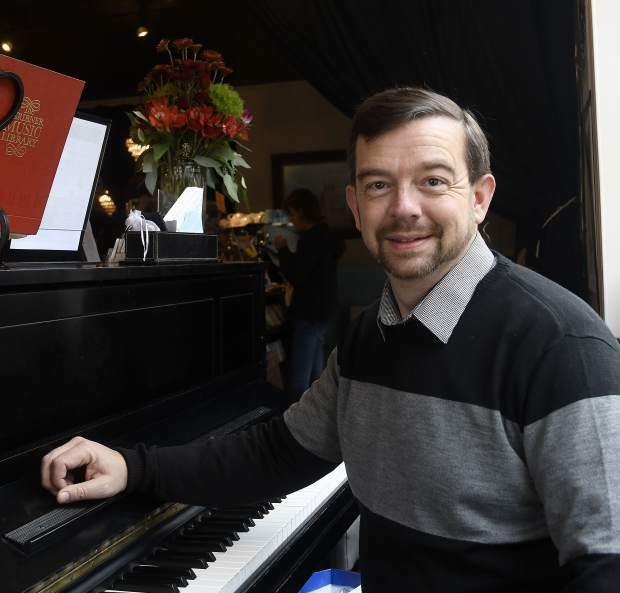 Sebastian Arreola mulls over artwork placement at the Aspen Art Museum on Tuesday. 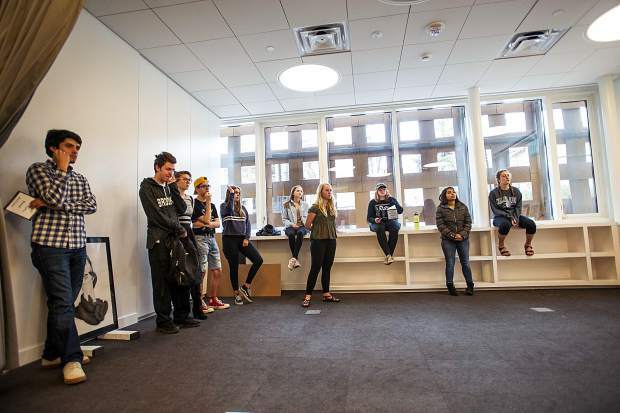 Sebastien Arreola, right and other young curators mull over artwork placement at the Aspen Art Museum on Tuesday. 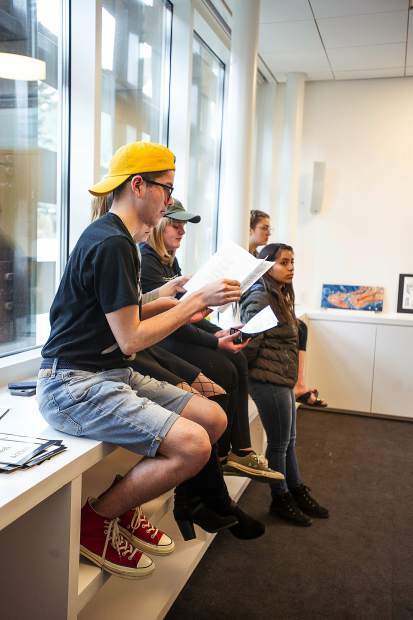 The Roaring Fork Valley’s brightest young artists are making their voices heard in a new Aspen Art Museum exhibition that tackles LGBT representation, calls for immigrant rights and aims to beat back sexism and misogyny. 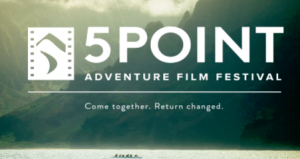 As young people take charge and take action across the U.S. this spring, in the wake of the Marjory Stoneman Douglas High School shooting, the annual Young Curators of the Roaring Fork show at the museum is likewise demonstrating a generation of teens committed to change and unafraid to speak up. 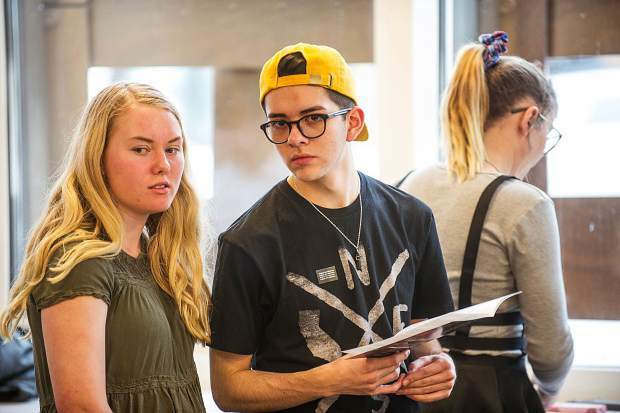 Titled “Real Artists, Real Action,” the topical show is curated by 12 student interns from Aspen, Basalt, Glenwood Springs, and Roaring Fork high schools. 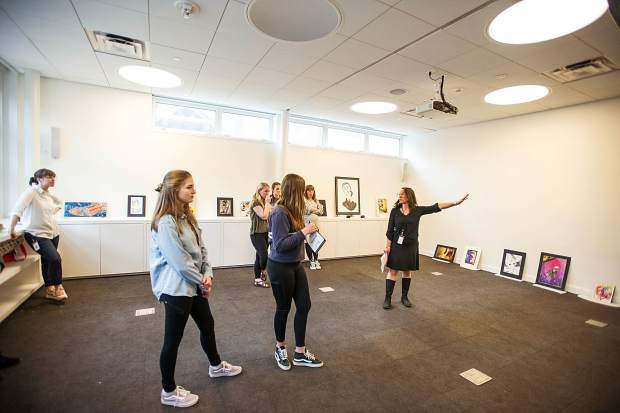 They selected 17 visual artworks and one poem by students at their schools as well as Coal Ridge and Rifle high schools. 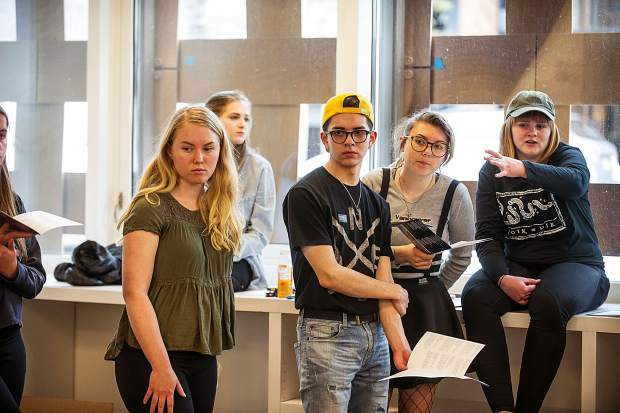 Running since 2005, the Young Curators program has engaged high school students in a six-month program that teaches students curating skills and empowers them to stage a museum show. The Young Curators met regularly over the past six months in sessions that included seminars on curating with museum director Heidi Zuckerman, curator Courtenay Finn and Wassan Al-Khudhairi of the Contemporary Art Museum in St. Louis. 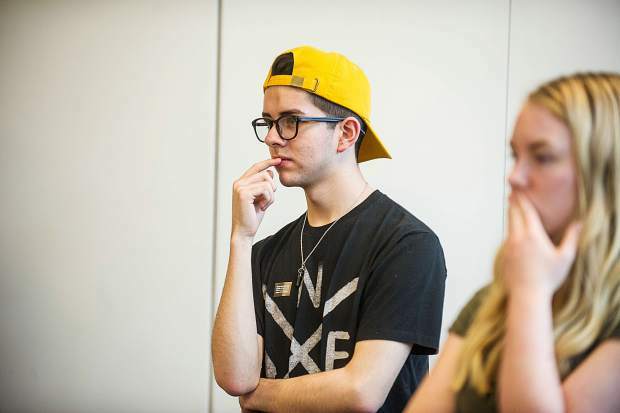 Their first jurying session was in February, one week after the Stoneman Douglas shooting and the student protests for gun control that erupted in its wake. Looking at the 70 submissions for the show, it was clear to Arreola and his colleagues that they’d used the exhibition to make a social impact and continue the momentum of the national youth movement. 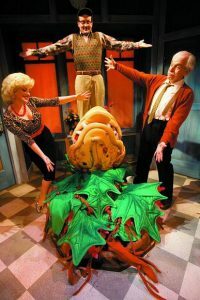 The exhibition is filled with deeply personal works about experiences with issues that are often obscured by politics. 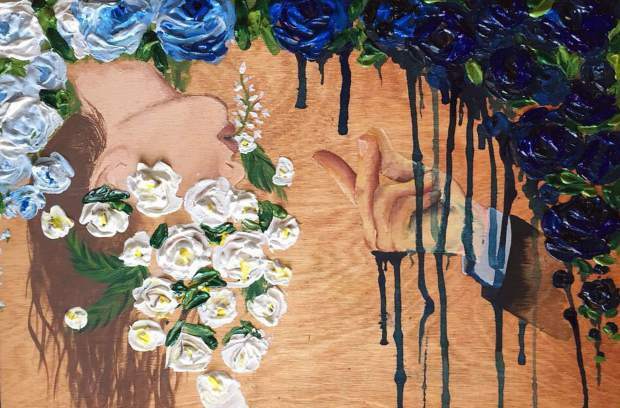 Tania Avitia of Rifle High School channeled her anxiety about her immigration status into a resonant painting titled “Blooming Dreams.” It depicts a woman’s head, upside down and her eyes covered by a cluster of flowers, with a hand snapping fingers in front of her. 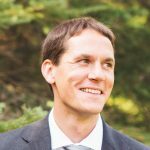 Avitia received a path to staying in the U.S. through the Deferred Action for Childhood Arrivals (DACA) initiative in 2016. The snapping fingers represent elected officials’ ability to take away her dream of staying here by rescinding her DACA status. “This piece tells the story of not just myself, but also 800,000 others who are in danger of losing jobs and educational opportunities,” Avitia wrote of her painting. 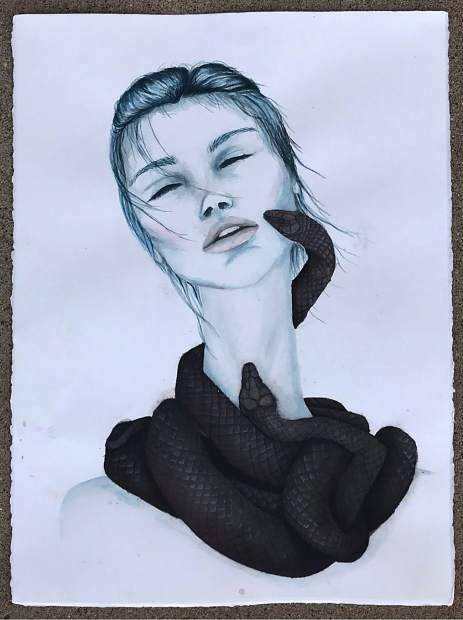 Her classmate, Lauren Giard, responded directly to the #MeToo and Time’s Up movements to end sexual assault and harassment with her watercolor “Times Up,” depicting a young woman whose neck is wrapped in a nest of cattails. The women’s movement that’s bloomed since the march on Washington in January 2017 resonates across several works in the show. 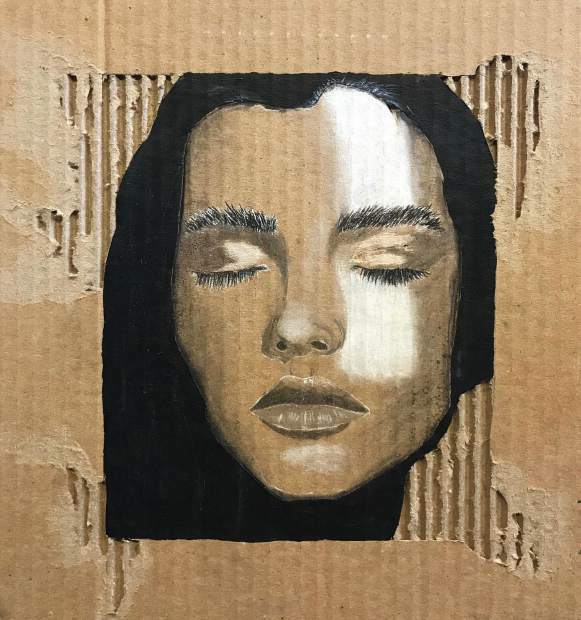 Among them are Roaring Fork High student Megan Rusby’s “Barcode Chick,” depicting a barcoded woman in a Sharpie drawing, and Aspen High student Ava Lassalette’s “Interference Stare,” made on a worn piece of cardboard. 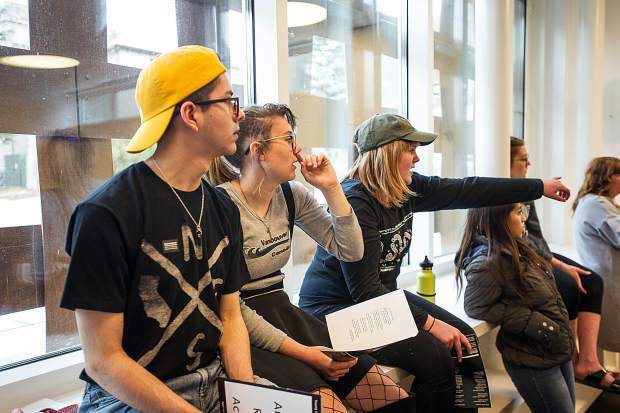 Museum learning director Michelle Dezember said she had been struck by the students’ commitment to social justice. While they were dealing with hot-button issues that divide the rest of the country, the Young Curators found common ground by focusing on the work and amplifying artists’ perspectives.